Vacuum lifting systems are designed to use constant vacuum pressure to handle heavy loads, such as steel road plates and concrete slabs. The proven technology eliminates the need for conventional lifting mechanisms that may damage materials. The Vacuworx systems handle up to 10 times more material than conventional methods in half the man hours, allowing contractors and landscapers to spend less time loading materials and more time focused on the job. Vacuworx compact equipment attachments are designed to work with the full line of construction-grade Ditch Witch mini skid steers. 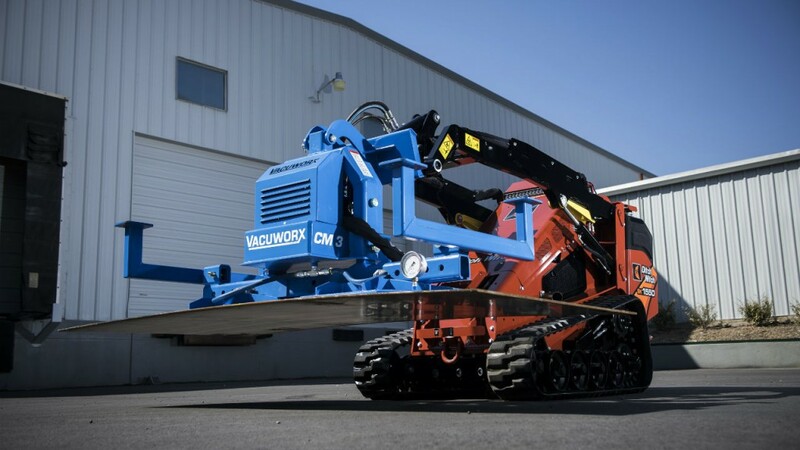 "Our partnership with Vacuworx will enable our line of mini skid steers to do what others can't, allowing us to continue offering our customers advanced innovation and expanded versatility," said Randy Rupp, Ditch Witch vice president of product strategy. "The vacuum lifting attachments help meet the growing challenges and needs of contractors and municipalities in the underground construction space." "We're thrilled to partner with the Ditch Witch organization," said Bill Solomon, Vacuworx president. "It allows us to expand the distribution of our vacuum lifting technology and reach new markets. We're dedicated to offering our customers innovative, cost-effective, safer solutions and this partnership enables us to further honour and fulfill that commitment." The Vacuworx PS 1 Portable and SL 2 Subcompact Vacuum Lifting Systems are compatible with the full line of Ditch Witch mini skid steers (the SK600, SK800, SK1050 and SK1550). The PS 1 can lift up to 1,700 pounds and is an ideal solution for lighter and smaller lift loads on compact jobsites that require the SK600 unit. The SL 2 weighs just 98 pounds and can lift up to 2,700 pounds It is also compatible with the full mini skid steer line, but to get the most out of its lifting capabilities, the SL 2 must be used in tandem with the SK1550 unit. The full line of Vacuworx products is available at participating Ditch Witch dealerships.